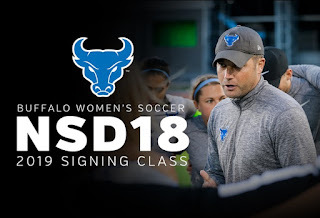 BUFFALO, N.Y. -- University at Buffalo women's soccer head coach Shawn Burke announced his 2019 signing class on Wednesday morning. The Bulls will welcome a total of seven student-athletes to a team that advanced to the Mid-American Conference Tournament for the fifth straight season in 2018. "We saw this year how valuable a deep freshman class can be and this 2019 class is no different," said head coach Shawn Burke. "With their club backgrounds and playing experience this group will come in and compete for spots right away. Our 2019 class has versatile players who can be utilized all over the field and the talent to continue to move our program forward. For the second consecutive year we are benefiting from Western NY talent and excited to grow our program locally." Chiarenza joins the Buffalo defensive unit after serving four years as a team captain for the Grand Island Vikings, guiding the Vikings to a 15-2-1 record her senior year under Coach Dave Bowman. Chiarenza helped the Vikings claim Section 6 championships in 2016 and 2017, and was named to the All-WNY first team in 2018. Additionally, Chiarenza was awarded with the Grand Island Outstanding Athlete Award in 2015, 2016 and 2017. Chiarenza played her club soccer for the WNY Flash Academy under Coach Kelsey Ferguson. Burke on Chiarenza: "We are excited to welcome Alexa's toughness and defensive prowess to our program. Her tenacity and grit will have an immediate impact at the college level." Evoniuk comes to Buffalo from nearby East Aurora, NY, where she stared at Nardin Academy despite missing her senior season due to injury. Evoniuk helped the Gators become champions of the Region One Champions League in 2016 and was awarded with Monsignor Martin Division A All-Catholic League Team honors. Additionally, Evoniuk played for the WNY Flash Academy under head coach Kelsey Ferguson. Burke on Evoniuk: "Ally's dedication to rehabbing from her injury is a great example of the same dedication she will bring as a player. Able to play in the back and midfield, her ability to be both a lockdown defender and attacking threat will find her valuable time as a freshman." Kasahara joins the Bulls after playing for Coach Doug Kircher at nearby Williamsville North High School. Kasahara served two years as a team captain for the Spartans, earning First Team All-WNY honors following her senior season. She also earned ECIC first team Section 6 Character Athlete of the Game honors on one occasion during her senior season. Burke on Kasahara: "Candice is another local product whose composure and soccer IQ are her best attributes. She has the ability to play both in the back or midfield and will bring a calming presence in our build up play." Mandarano comes to Buffalo from nearby York Central Schools where she netted 29 goals and 14 assists during her senior campaign on her way to setting the school record with 126 goals over her career for the Golden Knights. Mandarano earned Livingston County DIII Player of The Year honors during the 2017-18 school year, and was twice named to the All-Greater Rochester Soccer Team (2016-18). Mandarano's resume also includes a three year stint as a starter on the GPS Bayern Munich National Team. Burke on Mandarano: "Jenny's best attribute is her soccer IQ. Coupled with her ability to play anywhere on the field, Jenny will compete right away for time on the field and bring immediate depth to all layers." Murphy comes to Buffalo from Wantagh, NY, where she served as the goalkeeper for the Albertson Fury under Coach Paul Riley. During that time, Murphy's ability to shut down opposing offenses lead the Fury to a NYCSL State Cup Championship as well as NEWSS Tournament Champions in 2017. Additionally, Murphy helped lead the Fury to an appearance in the 2017 USCS Nationals Cup in 2017. Murphy played her high school soccer at Wantagh High, serving three years as a captain for the Warriors. During her senior campaign, Murphy set a career-high in saves (138) minutes played (1,412) and games started (16), and was named the AB1 conference goalie of the year. Burke on Murphy: "Erin comes from a great club background and will give immediate depth to our goalkeeping core. The growth we watched from her over the past year is exactly what we are looking for from a goalkeeper looking to push for time." Scalisi joins the Bulls after a storied campaign at nearby Williamsville South high school, netting 26 goals and adding nine assists during her senior campaign. The talented forward earned First Team All-WNY honors following her impressive senior campaign in 2018. Scalisi has played for a host of club teams in the greater Buffalo area, including Empire United in which she won a NYWSA State Championship with in 2015. Scalisi was also part of the WNY ODP team that competed in the ODP National Finals. Burke on Scalisi: "Tatyjana is another attacking minded player who has the creativity and savvy to break down defenders and backlines. We are excited to see her surrounded with our talented players and flourish in the college game." Wengender comes to Buffalo from Rochester, NY, where she attended Spencerport High School, netting 28 goals and assisting on 18, during her senior campaign for the Ranger Bears under Coach Jamie Schneider. Wengender's attacking prowess lead Spencerport to Class A sectional champions during the 2016, 2017 and 2018 season, and Class A state championships in 2016 and 2017 on the Ranger Bears way to an incredible 60+ unbeaten streak, a New York State Record. Wengender has been awarded first team All-Greater Rochester honors on three different occasions (2016, 2017 and 2018) and first team All-New York State team on one occasion (2017). Additionally, Wengender's accolades include being named the MVP in the 2017 NYS Championship match. Wengender played her club soccer for Rochester Futbol Club, playing the forward and center midfield positions under Coach Chris Mandarano. She currently holds the Monroe County record for individual goals in a season with 35. Burke on Wengender: "Leah is a crafty and creative attacking player. Her skill set is unique and very tough to defend and we will look for her to add to our record setting attack." With the addition of these very talented players to a youthful roster that only saw four seniors depart, the Bulls will look to build upon their 11-8 record from a season ago.